This episode was great. The plot revolved around the origins of the Dark One which out turns out to be a flip side of Merlin. Merlin drank from the Holy Grail and became a do-gooder wizard. He the fell in love with a lady, Nimue, who secretly drank from the grail and gave into to darkness thus creating the Dark one. Giving into darkness is killing and revenge. This show does take a simplic path to evil despite the grey tone to many of the characters. Also in the episode Merlin’s soul get tethered to Excalibur as he tethered the Nimue’s dark magic to the dagger or other half. The Dagger and Excalibur are also made from the Holy Grail. Merlin made into a sword to cleave his magic and immortality, Nimue is the one that broke it and Emma restored it at the end of the episode despite Merlin’s warning in 1989 not to put the sword togather. Excalibur can destroy either the light or the darkness so probably not too good pending on Emma’s true plan. This plot is getting more Star Wars all the time. One minor problem, if the Dark One and dark magic were created 500 years before the events of Snow White, Regina and David and Rumble was the Dark One for 200 years given Hook’s revenge plot. Seem like it should have been more than 500 years. I have another issue. 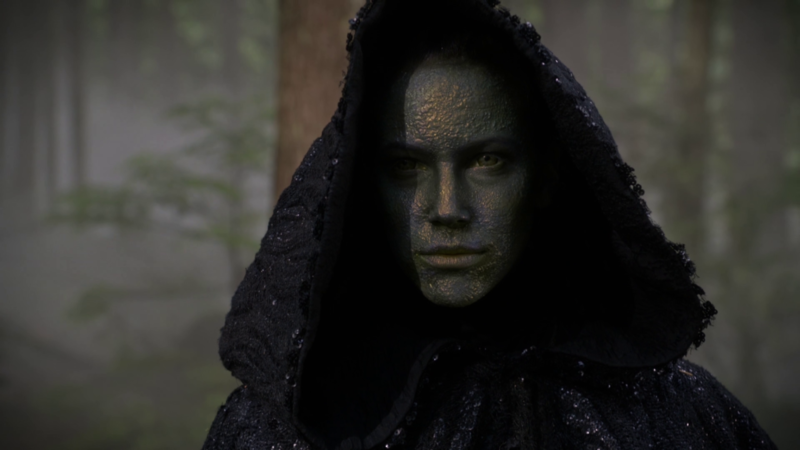 Last episode, Merlin’s voice mail said that to get rid of the darkness they should find Nimue, the original Dark One. Either it was a clunky line of dialogue to promote mystery of who Nimue is or only a Dark One can destroy the Dark One. Also Nimue and the Lady of the Lake are separate characters and there is no hint of Morgan le Fey. Boo. I do like how this arc doesn’t have a new bad big bad, Arthur hardly counts, he is a douchey mid-boss at best. All in all the mythos of the Dark One was great. Interesting and decently compelling. So Emma’s massive Dark One plan was to save Hook because she made him a Dark One when she tethered his soul after he got a nick by Excalibur and to save him from the darkness she wants to put the collective darkness in Zelena then kill her but before she can do that she needs to evict the baby so she used dark magic and spiked onion rings to expedient the Zelena’s pregnancy. Well it’s a twist Hook being a Dark One but doesn’t make much sense since the tethering of one soul SHOULDN’T have created a Dark One. I thought the darkness was born out of a Holy Grail drinker giving into to dark impulses Nimue was a Dark One before Merlin tethered her soul to the dagger. Does beg the question, how did Nimue successful touch and drink from the grail since the dude with Merlin was turned to ash. And it turns out Dark Ones all get resolidified at the vault expect Rumple since that is where Dark Hook appeared. It’s a continuity error because the writers invented the vault in season 3, guess it’s more Dramatic. So are we really to believe that when Emma took Hook’s memories he didn’t have an inkling of the darkness? Seems like he should have known something was up in his mind. He does have more of a temper this season but Emma was the Dark one, he has a history of hating the Dark One so his anger made sense but this turn of events seems like overkill. Also Emma’s motives were out of place of love so it makes her Not quite a villain, she just has darker methods. Gotta say most of the characters have been really flat this season. Most of their conversations are about how Emma is the Dark One but she isn’t Emma but she is but she isn’t. This episode does pull a big twist and the execution was bit all over the place.